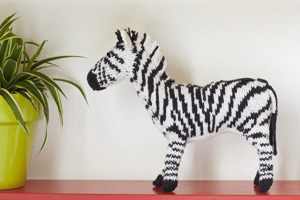 A living, walking Bridget Riley, the zebra is instantly recognizable and much loved. They are part of the horse species, although they have never been domesticated. Some think the stripes developed to confuse predators – a herd of moving zebras can look like one large animal, making it difficult for a lion to pick off one zebra. Attempts have been made to ride zebras, mostly unsuccessful, except for Rosendo Riberio, the first doctor in Kenya, who used to ride a zebra to make house calls. The animal’s distinctive black and white markings inspired the name ‘zebra crossing’.